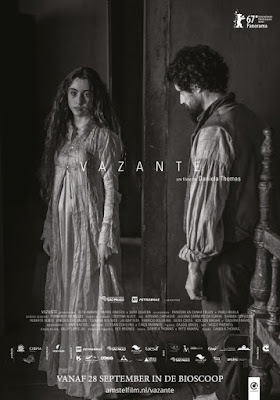 I was lured into seeing Daniela Thomas's VAZANTE (The Surge) because the listings I found listed it as an action adventure. An action film it is not. Nor is is it really an adventure. It is instead a slow burn drama with one hell of an ending. In 1821, a rich land owner returns home with a load of slaves and gifts for his wife and soon to be born child. Unbeknownst to him both wife and child have died in child birth. Filled with grief he eventually marries his wife's niece. However he returns to wandering while is new wife is left alone with the slaves. Slow building drama is a beautiful exercise in mood and place. Watching this film in a darkened theater you can't help but feel all sorts of emotions including dread, isolation and madness. The rich cinematography is a kind of extra character with each image filling in volumes that the characters never express. The sense of place and of isolation felt in this film is rare. I'm hard pressed to name a film outside of the work of Werner Herzog where you not only feel that you really are some place remote, but also that there was no one there but the characters (not actors) and a cameraperson recording reality. This is a special film, but it is also not for all audiences. This film is moves at a methodical pace. We are in a place and in a time and things more according to that time. If you can't click with the film's deliberate pacing you are going to feel bored. If you can click with the pacing then you are going to moved by the film, since the film is all about the ending.